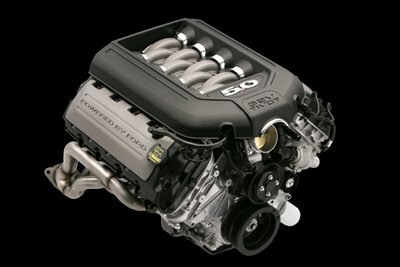 The big news from Ford is the coming release of the 2011 Ford Mustang coyote engine. This new and very powerful motor will be a 5.0 liter V8 (302 cubic inches) and the only similarity to the old 5.0 liter engine will be its displacement. 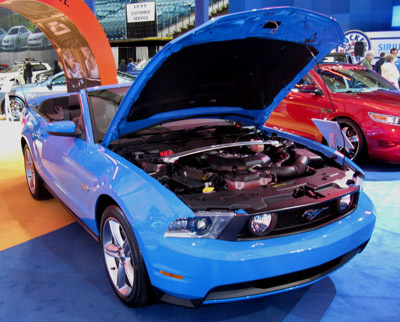 The 2011 Mustang coyote engine will be specific, at least for now, to only the Ford Mustang and will be manufactured at the Essex factory in Windsor. Power to weight ratio is an important factor and the coyote engine does its share to keep overall weight down to approximately 430 lbs. Power output for the new 5.0 liter engine is, for 2011 slated to hit the streets at 412 horsepower, with 390 lbs of torque at a fairly low 4,250 rpm and the twin cam motor will freely rev all the way to 7,000 rpm. With an output of just over 80 horsepower/liter, this is an impressive feat for a naturally aspirated motor. By comparison, the Corvette 505 horsepower Z06 at 7 liters would have to produce 560 horsepower,to equal the output per liter of the Coyote engine. No doubt, the twin cam helps it pass Ford's rigid NVH (noise, vibration, harshness) tests and Ford's work at producing light weight, but strong intake and valvetrain components seems to indicate there may be more in store for this engine in years to come. Since the engine was designed to hold up to increased pressure of a supercharger, it seems to follow that the rumors of the Ecoboost engine coming to a coyote mustang engine near you may be more than just a rumor. (the Ecoboost is Ford's new use of direct fuel injection and turbocharging to produce a powerful, low emission engine that also produces better fuel economy). Time will tell, but it sure looks like the 2011 coyote mustang will be the real Wyle E. Coyote. 2012 Boss 302 Coyote Engine: More Power ! You just knew they were not going to leave that howling Coyote alone didn't you? Well, you're right. 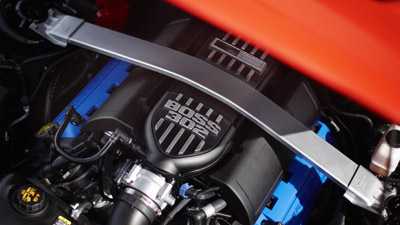 For the 2012 Mustang Boss 302 , they've upped power to a cool 440 horsepower, up from the already substantial 412 in the 2011 Ford Mustang coyote engine. But that's not all. Driveability and throttle response make this upgrade more impressive than an increase of that new 28 horsepower bump. And if you're lucky enough to win the lottery and get your hands on a new Boss, then, you'll also have the option of adding a very special dealer installed go-fast package, courtesy of Ford Racing. Called the Boss Track Key or TracKey , this adds a second computer to the 2012 Boss, giving it the exact calibration of the 2010 Boss 302r, complete with lumpy idle, altered shift points, engine timing and that extra horsepower too! Want to win a brand new customized 2011 GT with its awesome 412 horsepower 2011 Ford Mustang coyote engine? Don't miss this! Here's a link to all the details of the Mustang 5.0 Fever Sweepstakes and how to enter. Return from 2011 Ford Mustang Coyote engine to 2011 Mustang.